The Justice Health & Forensic Mental Health Network (JH&FMHN) implemented a number of solutions to provide equitable and efficient access to the new curative hepatitis C virus (HCV) medication in correctional centres across NSW. To treat 1000 patients for HCV as per the new key performance indicator outlined in the JH&FMHN Service Level Agreement with the NSW Ministry of Health, by 30 June 2018. Increases the number of patients tested and treated for HCV in the JH&FMHN. Improves clinical cover and satisfaction for staff working in the JH&FMHN. Improves the quality of care delivered to patients with HCV in the JH&FMHN. Increases access to specialist advice for staff working in the JH&FMHN. Enhances the efficiency of financial resources and reduces non-refundable pharmaceutical costs for the JH&FMHN. In recent years, the JH&FMHN has experienced unprecedented growth in patient numbers, with the overall inmate population growing by 15 per cent between 2015 and 2017. This number is expected to increase further, which has led the NSW Government to build a number of new prisons across the state1. New highly-effective, curative medications for HCV have also resulted in a significant increase in the number of patients requesting treatment. To ensure equitable access and the effective scale up of HCV treatment in the custodial setting, the NSW Ministry of Health has revised the key performance indicator in the Service Level Agreement with the JH&FMHN, increasing it from 157 patients treated per annum to 1000 patients treated per annum from 2017-18, an increase of 537 per cent. 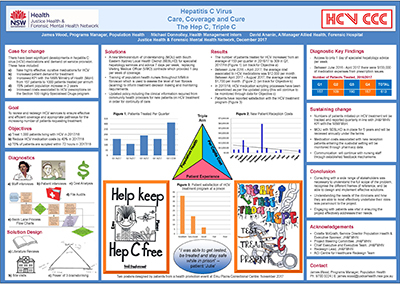 To achieve this, the JH&FMHN required a new model of care that would allow more patients to be tested and treated for HCV without compromising the quality of care delivered. A project plan was developed to clearly define the goals and governance of the project and a high-level steering committee was established. The diagnostic phase involved interviews with 21 stakeholders, including patients, senior medical officers, nursing staff, senior executives, health records and information management staff, and pharmacy staff. Patient file audits were conducted and a financial analysis was performed, assessing the amount of waste from the current system. This process identified the following key issues. Access to specialist medical officers one day per week was not sufficient to meet the service’s needs. For patients entering the custodial setting partway through their HCV treatment, a highly specialised drug (HSD) script is required to continue the regimen without any missed doses. However, the process of preparing the HSD can result in delays. In instances when the medication was being dispensed without a HSD to minimise missed doses and adverse clinical outcomes, JH&FMHN bore the cost as it is unable to be claimed through Medicare. The medication costs $700-800 per day. The service could not treat enough patients to reach the new key performance indicator under the Service Level Agreement with the NSW Ministry of Health. To address these issues, the following solutions were developed via brainstorming with stakeholders, using the Power of Three technique and a site visit. A new memorandum of understanding (MOU) was developed between JH&FMHN and Prince of Wales Hospital, for the provision of specialist medical advice in hepatology. This replaced existing visiting medical officer contracts and the existing MOU with Hunter New England Local Health District. The new MOU will provide seven days of specialist coverage, supporting HSD preparation and general clinical advice for patients who require HCV treatment. It will also allow JH&FMHN to support a broader statewide service. As of November 2017, negotiations to establish the new MOU are in progress. A new policy for the management and treatment of HCV was developed, including a clear and defined section on the transfer of care for patients who have started HCV treatment in the community. It includes a list of information to be included in a request for information to community health providers, for new patients entering the system. The new policy aims to reduce the time it takes to collect the necessary information for HSD scripts, to reduce missed or incorrect doses and associated costs. Prior to approval, the policy went through two rounds of consultation with stakeholders from population health, primary care, adolescent health and pharmacy. Prior to the project, only two transitional nurse practitioners and clinical nurse consultants could operate the Fibroscan machine in NSW. These machines are used to inform clinical decision making and the level of liver fibrosis. An additional Fibroscan machine was acquired and rotated between correctional centres in NSW, with public health nurses in six correctional centres trained in the use of the machine. The project team will analyse the requirements of Fibroscan versus other biomarker algorithms, to determine the level of fibrosis required to inform treatment decision making. costs associated with dispensing HCV treatment without a HSD script. Greater awareness in the JH&FMHN about the urgency of HSD scripts has already resulted in a reduction of out-of-pocket costs. Between June 2016 and April 2017, JH&FMHN spent $133,038.97 on HCV medication while waiting for HSD scripts. Between May 2017 and August 2017, only $6,837.97 was incurred. Consulting with a wide range of stakeholders is necessary to understand the full scope of the problem and realistic solutions to address them. The project team needs to be sufficiently flexible and resilient to adjust to unexpected events which affect the project. Perfecting a one-minute ‘elevator pitch’ to quickly and simply explain the project to somebody unfamiliar with it is essential to gain broad support. Having a supportive and accessible executive sponsor is a key feature of a successful project. Project teams should maintain frequent communication to ensure any issues that arise are quickly managed. Understanding the needs of the clinicians and how they are able to most effectively undertake their roles is paramount to designing solutions. Clayfield M. NSW prison numbers grow 15pc in two years to reach record high, amid overcrowding concerns [Internet]. Sydney: ABC News; 2017 [cited November 2017]. The Kirby Institute. Monitoring hepatitis C treatment uptake in Australia, Issue 7 [Internet]. Sydney: UNSW Sydney; 2017 [cited November 2017]. NSW Ministry of Health. NSW Hepatitis C Strategy 2014 – 2020 [Internet]. North Sydney: NSW; 2014 [cited November 2017]. NSW Agency for Clinical Innovation. The clinical management of people living with hepatitis C. ACI: Chatswood, NSW; 2016.